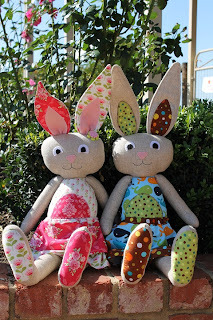 Jody's Crafty Creations: Just in time for Easter.. I managed to finish making my kids these Easter Bunnies just in time for Easter. Evey year for the last 4 or 5 years I have made them each an easter gift. I made a reversible chick/egg toy for them last year and some small softies bunnies each the couple of years before that. This year I decided to GO BIG - just for something different and made them each a BIG softie Easter bunny! This was a fun project as I had no pattern and so just sketched it out and got creative! 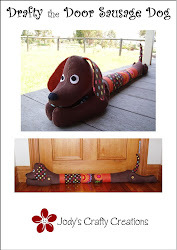 Love doing that..it was heaps of fun and the kids loved the finished toys. They stand 55cm tall from head to toe and their floppy ears are another 20cm above that! The girl bunny my daugher named Honey Bunny and she wears a little 2 layer skirt and the boy bunny - my son named Jack Rabbit and he wears a pair of board shorts. They loved watching me make them and of course loved it when they were finished and they got to keep them on Easter Sunday. 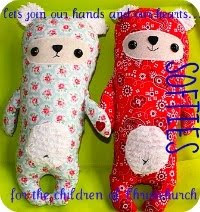 absolutely adorable Jody - are you going to release a pattern?? These are the cutest little bunnies ever.